In the mid-1700s, there was a so-called "Neapolitan school" of musical composition made up of a number of highly regarded composers, most of whom, as noted, concentrated their efforts on musical drama. (See this link to Other Composers.) Within that school, there are, of course, other names besides the ones I have listed, including performers who composed music for their own instrument. 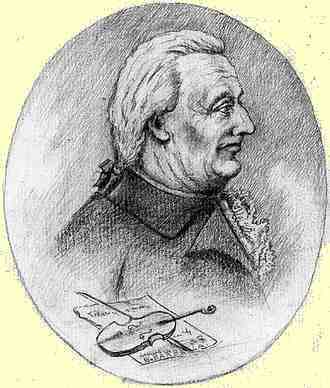 One such contributor was Emanuele Barbella (1718-1777). He was not only an esteemed violinist, but, more importantly, composed a significant number of compositions for stringed instruments, some of which have been revived and recorded and others of which, unfortunately, still languish in manuscript form in various places, including the Naples conservatory. Barbella learned the violin from his father, who taught at the Santa Maria di Loreto conservatory, one of the original four conservatories in Naples. Barbella eventually studied composition with the well-known composer, Leonardo Leo, and also went on to become first violinist with the Teatro Nuovo in Naples as well as part of the San Carlo orchestra. Much of what we know about Barbella comes from Charles Burney's The Present State of Music in France and Italy, published in 1771. Burney visited Naples in October of 1770, depending on Barbella for a musical tour of Naples and subsequently speaking highly of him as the “kindest human being that I’ve ever known”, with a character as “sweet as the sound of his violin”. Barbella probably visited London in the 1760s since many of works were published there for the first time. In Naples, Barbella found a friend in William Hamilton, Britain's Minister Plenipotentiary at the Bourbon Court, who was likely his intermediary with the London editors. Barbella dedicated some of his compositions to Hamilton. Barbella's compositions include a vast array of music for solo string instruments, duets and trios for combinations of string instruments, for strings and flute, concertos for mandolin, and a delightful lullaby for violin and cello that is still performed enthusiastically at local performances of music from that period. As well, he collaborated on a comic opera, Elmira Generosa, in 1753. There are some recordings of his works and even a few video performances on the internet.